HMD Global has officially announced yet another pocket-friendly phone called Nokia 130 (2017). As the name implies, it's the 2017 upgraded version of the previously launched Nokia 130. 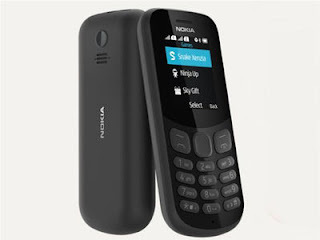 The phone will come running on Nokia S30+ OS with lots of pre-installed games to choose from; likes of the popular Snake Xenzia, Bounce, Soccer and the rest of them. Nokia 130 (2017) features a 0.3MP back camera alongside a Led torchlight which is mounted at the back. There are different colors option to choose from, which are Red, Grey and Black. Have a look at the full specs and price below. Display - It has TFK, 16,000 colors, 1.8 inches display screen with resolution of 120 × 160 inches. Memory - It has 8MB inbuilt memory storage and 4MB of RAM that can be expanded with an SD card of up to 32GB (dedicated slot). Price - Nokia 130 (2017) costs $21.50 which ranges from 6,000naira to 7,000naira in Nigeria. Normal needs leave this small phones for tecno and the likes. And focus on high end rugged phones. No doubt, Nokia has been at the top of phone makers in the world. I will always prefer their products because of its reliability.